I know I know, this is an often-chosen and kinda obvious pick. But I discussed the first novel with my Mum last weekend and now I'm really into the series again! I think The Golden Lily ended at such a fascinating point for Sidney concerning her powers and her loyalty-situation. I'm extremely curious to meed Marcus. And of course I want more Sidney/Adrian scenes :P Plus, the cover is gorgeous. I can't wait to put all three books next to each other on my shelf! I love Richelle Mead and The Golden Lily left at such a cliffhanger. I finally read Bloodlines after being a bad VA fan for far too long. 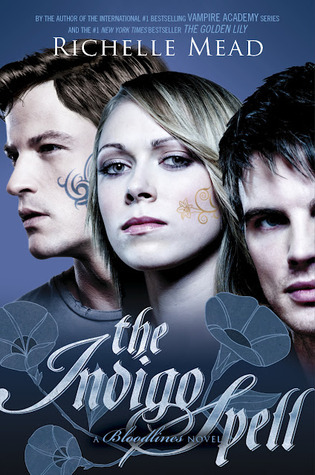 Hopefully I start Golden Lily soon and then can join everyone in waiting for The INdigo Spell. Great pick! I loved the Vampire Academy! Still have to start the spin off, but I'll some time! Thanks for sharing and stopping by. I haven't read the second book yet but I'm a huge fan of Richelle Mead's and I can't wait to read both books. I have no doubt they are going to be amazing. Great pick! I'm totes dying for this one after the way The Golden Lily ended! Great pick!!! Def a great choice! I haven't started this part of the series. Think I'll wait till it's all out. Did that with VA and was very happy being able to read them back to back.